Cryptomundo » What’s the Ajax Lorax? A new unknown dead thing has turned up; this time in Ajax, Ontario, according to the person who found it. I have to coin it as the Ajax Lorax, for, like Dr. Seuss’s critter, the Lorax, does this cryptid speak for the trees? What do you think the Ajax Lorax is? This entry was posted on Tuesday, July 31st, 2012 at 10:11 am and is filed under Breaking News, CryptoZoo News, Weird Animal News. You can follow responses via our RSS 2.0 feed. You can skip to the end and leave a response. Pinging is not allowed. Update: What The Hell Is This? I’m tempted to call this a decomposed hellbender, but to my knowledge that giant salamander does not really leave the water, and I’m not sure if it is even native to Ontario. It looks amphibious or reptilian to me, but that could just be due to the advanced state of decomposition it’s in. Looks like a decaying beaver or something, every animal if left to decay will go through stages of looking odd, get a grip. It certainly looks like a hellbender, but it could be a beaver or something else in thebadger/otter/weasel family. The head is the most deceptive looking part, with that triangle shape partly coming from having more flesh worn away or dessicated towards the nose, and those two hole that are too far away to be nostrils and too far forward to be eyes. Mammals, though, have a hole through the cheek for nerves, and that’s probably what those hole are. I was also thinking something in the Mustelid family, perhaps a Marten. I think the aquatic appearance is more likely decomposition, as someone earlier said. Definitely interesting looking. Looks like a skinned out beaver left to rot. 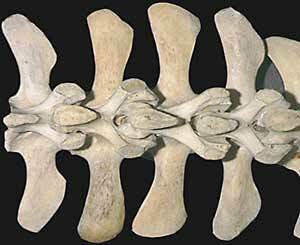 The thickened vertebrae at the base of the tail agree with images I can find. As usual, pics contain little scale, no close ups of head or limbs, and the usual idiots are in calling it a “turtle out of it’s shell” which is physically impossible. 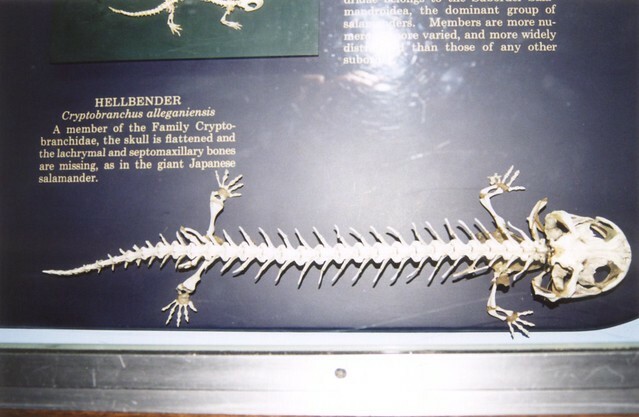 THAT is a hellbender skeleton. The skeleton here has hip bones that are too well developed, and the rib cage is also too developed. Not to mention the fact the head is the wrong shape-the skull of a hellbender is semicircular in shape, not triangular. So whatever it is, it is NOT a hellbender. Poor scale, no closeups of the head or limbs. That said, it looks remarkably like a skinned out beaver left to rot. Two and a half feet sounds too big to be a hellbender, assuming that estimate is accurate. Also, the rear limbs look too long and articulated to be those of a salamander. Maybe a fisher or a wolverine? This was pretty intriguing for awhile, but in reading the Reddit comments, I saw a suggestion that it was a shell-less snapping turtle. That would put this find in the northern part of its range, and would make sense with the potential aquatic environment source. It also makes sense to me why the appendages seemed so unnaturally long, particularly relative to the apparent bulk posterior to the pelvic girdle. It also fits the vertebral appendages/spurs whatever those are called in snapping turtles. The only thing that still doesn’t add up for me is the neck length (seems too short – but the details may be obscured by the decomposition/dessication and remnants of the skin. I bet it’s just someone’s pet tegu or savannah monitor. A scale reference would have helped. I say Beaver. 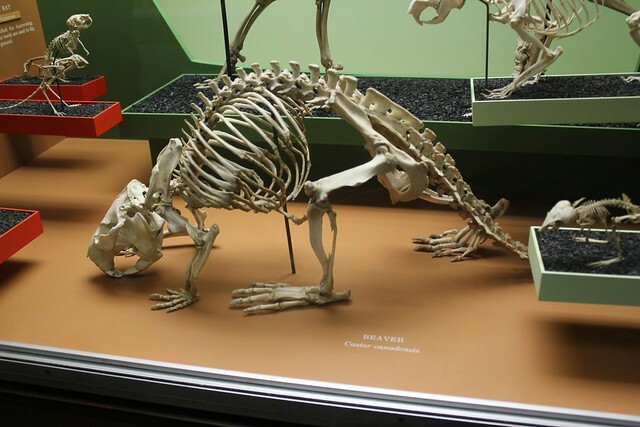 Google Beaver skeleton, the tail nails it. For the last time, there is no such object as a “shell-less turtle”. The carapace (shell) is formed from the spine, and the plastron (bottom shell) is formed from the ribs. Looks a lot like a decomposed North American Badger, especially around the head area which bears a resemblance with its rectangular bulgy shape and pudgy ears. This case is not that easy to solve, as there is not much anatomical data (i.e. bones) really visible. At first, NO, it is not a turtle without shell! People, stop thinking turtles can lose their shell! Their shell consists of their ribs, so they can´t get lost like skin. The rest of the anatomy doesn’t fit a turtle anyway. Actually there is a quite simple and – as I think – rational explanation. Given the size, shape, locality and especially a particular anatomical detail, this is next to sure a beaver. Of course there are still muscles attached to the skull of the carcass, so the head looks still more massive. You don’t find such spinal processes in raccoons, fishers or the other supposed mammals like otters. Did anyone suggest a shell-less turtle? Just kidding, those are good points about the turtle – I’ve seen many shell-less, but they were also less many other things, having had them removed via highway traffic. Another thing I was thinking of – since on last season’s Game of Thrones there were still three viable dragon eggs after all those years, maybe there were more? And this one didn’t make it? Any reports of fire in the area? The carcass has obviously long ribs, whereas turtles have no long ribs. Physical damage can only remove parts of a turtle´s shell, if the whole shell would be really removed, there would be nothing left but a tiny dorsal spine.